A couple of weeks ago I had a little book launch at Warwick Business School. Professor John Benington and Eugene Walker of Sheffield City Council said some nice things about the book (and about me) and I gave a little response. Below is roughly what I said. Let me tell you a little bit about why and how I wrote the book. As mentioned in the preface the book stemmed from a conversation John Benington and I had whilst spending about 12 hours in transit at Nairobi Airport. We were on our way back from spending a week in Juba, in what became two weekends ago the world’s newest country, South Sudan. We had been there to deliver some financial training to about 50 civil servants, an experience that I’m very proud to have and it led indirectly to my teaching here at Warwick and the writing of this book. John was telling me that he and his colleagues had never found a finance textbook that was suitable for the public sector programmes. There are plenty of books in the business section that cover financial management for non-accountants, even WH Smith and airport bookshops stock them, but there’s nothing aimed at public managers. One thing, then, that makes my book (wow, my book!) unique is that it is about managing public money. I think that is an important distinction. Despite the government’s current austerity policies, the public sector is very important to this country. One could argue that the existence of coherent, comprehensive public services is one of the ways that we identify which countries are developed countries. Developed countries have healthcare, good transportation links, literate and numerate citizens, safe and secure neighbourhoods, clean air, food and water. All things paid for by public money (more or less). Perhaps the public sector is, for those same reasons, more important still in developing nations -- because they face challenges about lower life expectancy, illiteracy, lack of security and so on. And public services are big business. Nearly 700 billion pounds in the UK. That’s a lot of money and it is managed by goodness knows how many public managers. I wanted to write a book aimed at those managers. 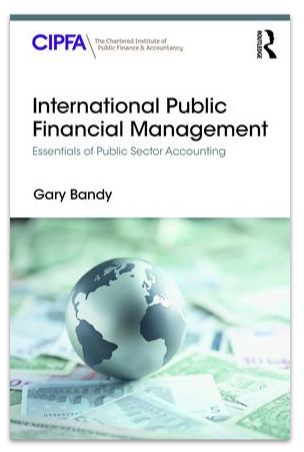 In fact, the book that I pitched to Routledge and some other publishers was more along the lines of How To Manage Public Money. A few publishers said they liked the idea but didn’t know how to sell such a book (it wouldn’t be one to fly off the shelves at Heathrow) but Routledge offered me a contract on the basis that I fitted the book into their Masters of Public Management series. I thought “fine” but after looking at a couple of books in the series I realised that they had in mind something more academic than I was planning. It wrong-footed me for a while, until I had a workshop with some colleagues here and got the sense from them that the publisher needed a book and it would be fine if I wrote what I wanted to write. What you see today has got, I think, a more practical feel than many textbooks do. I kept in mind when I was writing it the idea that it should be understandable to social workers, town planners and headteachers and each chapter has a section towards the end which are practical issues rather than theory. The final chapter with its ten principles for managing public money is a remnant from the original pitch, too. I first met John on the introduction weekend for the Warwick MPA. One theme running through that course was the concept that public managers work to create public value. It’s a powerful idea and one which seems to me to describe very well the things I’ve seen and done in 20-odd years of public service. It was inevitable that if I wrote a book it would reflect the way that I see the world and, therefore, I make no apology for the inclusion of many references to the theory of public value. I am not an expert in the theory but still I have put forward a couple of ideas that stem from it. First I have had to audacity to take Mark Moore’s public value triangle and translate it into a budget triangle. Later I have sought to conflate the idea that a public manager’s job is to create public value with the—now ubiquitous—expectation that everything a public manager does is value for money. I am suggesting that there should be a concept of public value for money. It is a difficult concept to quantify. In a market trade the buyer and seller exchange things so that each ends up with something they value to be worth as much as, or perhaps more, than what they gave away. For a public service. on the other hand, there are multiple stakeholders who each place a different value on the service and, generally speaking, none of them are paying directly for the service (that is, they are not giving anything up in direct exchange for the service). Finally, I learnt a lot from writing this book. I learnt a lot about the subject because I did plenty of research about the theories that related to aspects of financial management that I had only practical knowledge of. I learnt, too, that sometimes things work out differently from how you expect. It had been an ambition of mine to be a published author. Five years ago I wrote a novel but my approaches to publishers were rejected 30 times or so. Perhaps I’ll never have a novel published but here I am, a published author. I even have an author page on Amazon. The point of the book isn’t so that I can feel good about myself, but to be something that helps public managers learn about public financial management. To that end I sincerely hope that it finds an audience who use it, or parts of it, to improve the value for money of whatever services they provide to the public.